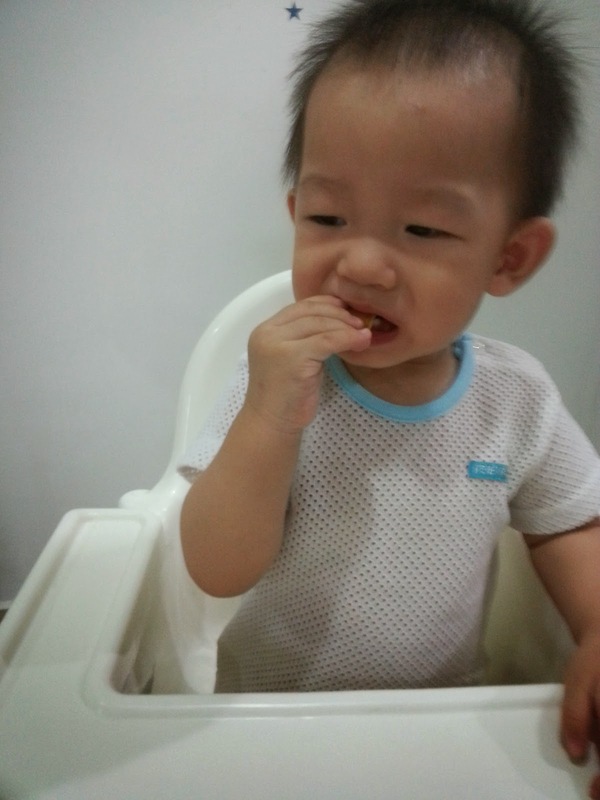 This post is about kid's food and kid's faces again, coz really, I stay at home ALL the time. Even if we go out, it's either to the mil's or to my mum's. 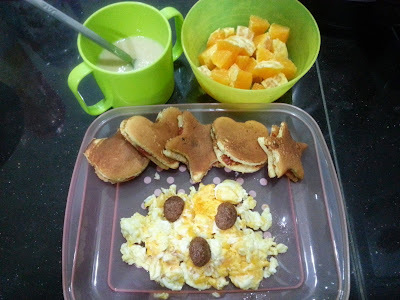 Anyway, my Sunday begins with preparing food for the kids. For a change, I didn't cook porridge that day. 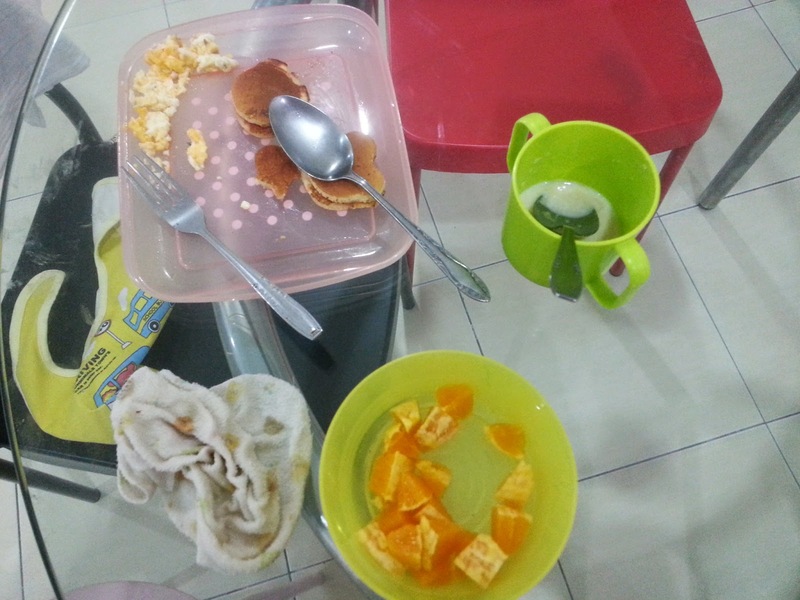 I made pancakes with strawberry jam, scrambled eggs, cut up some oranges and made a cup of Nestum for Kz. As for G, I let him hold some pancakes and he loves it. P/S: Can you see the scar on his forehead? Yep, the stitches are healing, but there's still a scar. Sigh. Oh, you didn't know what happen to him? Here. The picky eater slowly enjoying his breakfast, but I don't think he could finish all. Well at least he ate SOME of it. After he left the dining table, this was what left. Better than no eat at all, yes? What? No more? But the title is "Our Sunday". So what happens after breakfast? The same old thing - they watched TV, then nap, then lunch, then play, then nap again and ta-daaa, night time already, everybody sleep. Dont worry. My Sunday is more or less the same! Haha. Except last night for first time brought Jamie to McD's. Luckily he was well behaved other than made noises to be fed. But I always see you bring the kids out here & there wor.. So nice la.. Eat fish & chips somemore, remember? And you went to buy groceries after that.. Best !! Hehe.. Your Sunday reminded me of my Sundays many years ago! I pun buat macam ni.. dulu ye.. not now.. hahahaa... All the time spent on the kids' preparation of food only.. and now trying back to recall also cannot remember much.. so now at least you have a blog to remember what you did for them and when they grow up, they will really appreciate what you have done for them.. hehehe.. So... I thought that was supposed to be KZ's breakfast? Or is it G? He seems to finish most of it, right? Good boy! I like the picture of him smelling the pancake.. ."hmmm.. this one what flavor ah?" Hmm, I just can't wait - for them to grow up a little.. Just, a little.. Not too fast, haha.. Big enuff for me to bring them for rides, like you.. You know, weekends is like being a prisoner, hubby's not here most of the time.. I'm stuck at home.. If the kids are a little bigger, I can bring both out in my car, for a while, and come back, just in time for their nap. Nice mou? Yep, all my time is spent washing clothes, hanging clothes, vacumn, bathe the kids, prepare their meals and rock them to sleep.. 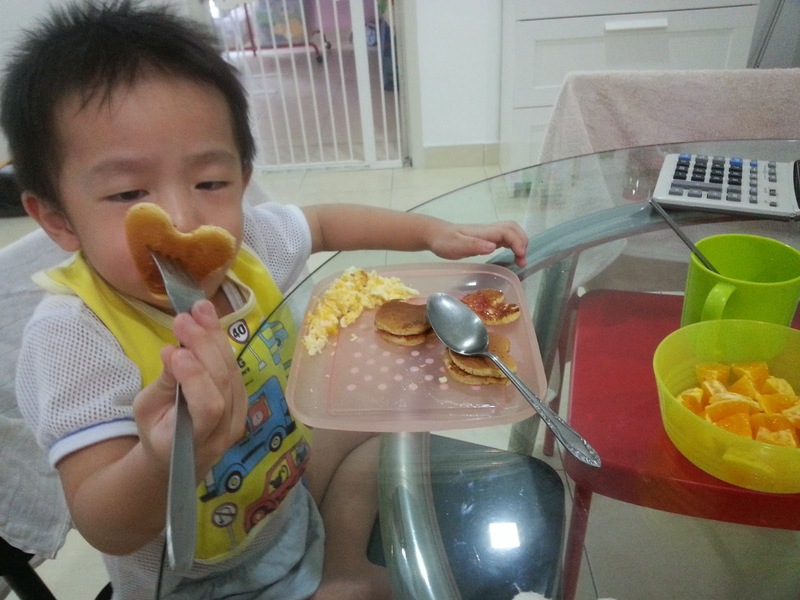 It's Kz's breakfast.. And I just let G hold a piece of pancake, else, he will be very noisy..
Those cookie cutters, I got it free when I bought Kz's formula milk powder, hehe..
Can see G ate most of the scrambled eggs so very good already. I think I also cannot finish all the food you gave him but the variety is good, balanced meal but the amount is a bit much even for me. What a good mother you are to prepare a variety of food for G.
Sorry, sorry I meant for Kz above not G.
Portion a lot? Just one egg, oh yes, maybe the pancake's portion is a lot la, coz I "kiap" 5 of them together with jam.. But well, he only ate about 2.5 pancakes, haha..
Everything together is a lot. A cup of drink plus the orange will fill up the tummy already. Kz ate 2.5 pancakes and nearly all the egg and some oranges so he must be quite full. For G, to see him smelling your pancakes - so cute! Can see a bit of his scar. I have a scar on my forehead to - my parents took me for stitches after I have been scratched by a monkey when I was 6 months old. Now cannot really see the scar already so when G grows up, I don't think the scar can be seen easily. Yep, the picture's not very clear.. If you see him in person, sekali pandang can see the scar already and think "Oh this kid sure kena stitches before".. It's that obvious.. Your Sunday sounds good wor. Just be at home bonding with your sons and husband, no need to go out to "fight" with people on the road and in supermarkets. I also did not go out much during weekends because I am scared of "fighting" crowds. Have a nice day! Enjoy your lunch! Ya, when both of your sons are older, you can bring them out to jalan jalan during weekends and the 3 of you can "battle" the crowd together! Sometimes, I just hope they are a lil' older.. Not too much, just lil' only.. Now, they are still controllable.. Kz's still afraid of me when I give him my killer stare.. Once that doesn't work anymore, I don't know what I should do, teehee..
that's the life of a mum with toddlers..soon they will grow up. So just enjoy them..
hmmm, not bad also la at least your life is not all at home only.. you still go to work and then your parent's and in-law's place.. and oh, not forgetting 45min of shopping time a week?? fuyoh this breakfast is so not your style, or is it just me who think so?? got variety woh, the pancakes are shaped woh, the orange was cut into pieces woh, got three pieces of kokokrunch on the scrambled eggs woh, and no cheese I supposed woh..
okaylah at least your K and G ate them better than none.. maybe you should put cheese as your pancake filling and he would have eaten more, well that's his favorite right?? BTW I suddenly interested to know the initial of your hubby leh.. if it's B then it will be fun lor, then you will have KGB at home that you serve everyday, haha!! Dinner ahh? No need say ler, later readers boring, dinner either tapau or if lazy go out, just cook noodles with my leftover ABC soup in-a-jar lor, hehe.. Hubby's initial is WWV. Haha..
Free cookies shapers from the formula milk powder I bought for Kz..
That's normal la, I also have similar routine everyday, huhu! Your pancake looks good, got shapes some more. Glad to know the stitches is healing, as for the scar, don't worry too much, I am sure they will fade off eventually. Yep, sweetie, must cut into small cubes for the kid, else, he won't eat..
No worries... You are not alone. Things will become better when your boys get older. I like those star and heart-shaped pancakes! Oh, G is a picky eater eh? He definitely needs those stars and hearts haha!! I used cookie cutters to shape the pancakes, free from Kz's formula milk powder, hehe.. I hope so too foong.. When the kids are slightly bigger, I can bring them out and drive around, make them tired, then come back just in time for them to zzz..
Oiks! My comment disappeared? I just tekan publish only, gone. Aiyah start all over again. Louiz, I just came back from a two day seminar. Looks like Kenzie ate quite a lot. I can't really see G's stitches and I am glad he is healing well. I like his second photo where he smell the pancake. What are those 3 things on the scrambled eggs? Look like 3 big brown nuts. Sweetie, they are Koko Krunch, hehe.. Oh yes, I was surprised Kz finished 2.5 pancakes and most of the eggs.. And the Nestum too.. But he didn't quite like the oranges..
Oh yes, when I think of you, I think of the rotan. And yes, I have the rotan beside me. In fact, that day, he didn't wana eat. 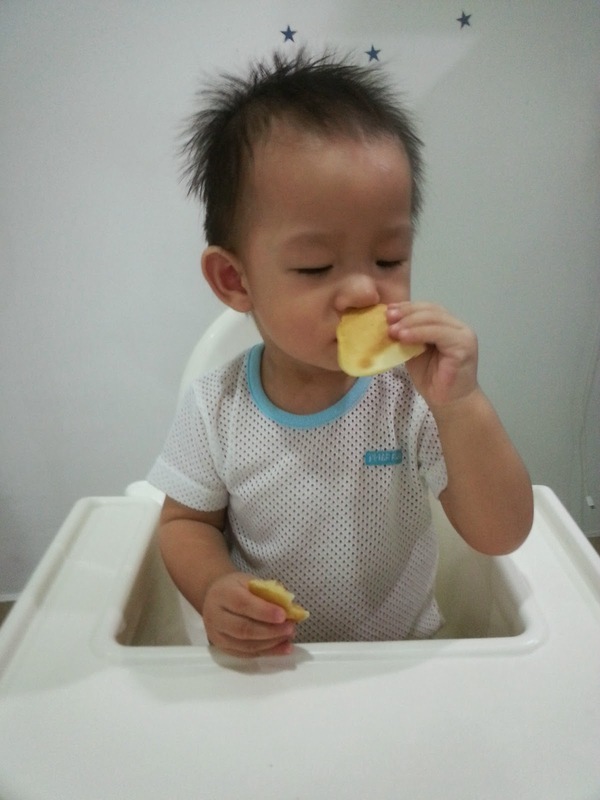 When I said "tang tiu leh" (where's the cane), he immediately sat down and ate. Ala, women! Biasa la. If we don't protect/cover our (pretty) face and let it kena the sun, then our face will have blemishes la.. And we have to fork out thousands for laser leh !! Your pancakes look yummy! Do you bring your boys out to the mall on Sundays? We usually bring them out to hypermarket on Saturday, before going to my MIL's.. Sunday, errr, nope, no malls, no shopping centres..Occasionally yes..
You sure make food so appetizing. Yum! very creative mea;/ You have got :Sum Kei" to do leh.